SETI stands for the Search for Extraterrestrial Intelligence and whilst the possibilities of finding other life in the Universe must have been considered for centuries, the current SETI searches had their origins in 1959 when Guiseppi Cocconi and Philip Morrison published an article in the British Science Journal Nature in which they pointed out it would in principle be possible for civilisations to communicate across space using radio waves. There are then two intriguing possibilities, firstly that we might be able to evesdrop on any such signals and secondly that another civilisation might be attempting to communicate with us. A young American radio astronomer, Frank Drake, had reached the same conclusion and in the spring of 1960 used an 85ft diameter radio telescope at Green Bank, West Virginia, to make the first attempt to detect interstellar radio signals. He observed two stars which were very similar to our Sun as it is believed that life is most likely to be found on planets in orbit around sunlike stars. They were Tau Ceti and Epsilon Eridani, visible to the unaided eye and some 11 light years away. The experiment was called Project Ozma after the queen in the imaginary land of Oz. The two stars were observed at frequencies close to 1420 MHz. This frequency was chosen as it is the frequency of the natural emmission of radio waves by Hydrogen and would be known by any civilisation who had acquired the technology to communicate across space. Drake and his colleagues were looking for any repeating sequences or patterns that would indicate an intelligent origin. No such signals were found, but this pioneering effort led to searches of greater and greater sensitivity and sophistication culminating with Project Phoenix at the present time. Frank Drake, now President of the SETI Institute who operate Project Phoenix, was the originator of the Drake Equation which attempts to estimate the likelihood of the existence of other civilisations in our Galaxy who are capable of communicating with us. In the early 1970's NASA's Ames Research Centre commissioned a panel of outside experts to produce a comprehensive study of the technology that would be required to carry out an effective search. They produced the Cyclops report that is the foundation on which most of the current work is based. Though the giant array envisioned by the Cyclops report was never built, many searches were undertaken as a result of the perception that SETI had a reasonable chance of sucess. The longest running of these was carried out by the "BIG EAR" radio telescope operated by the Ohio State University. On August 15th, 1977 the telescope received one of the strongest signals ever detected, now known as the "WOW" signal after the comment written by the observing scientist, Jerry Ehman, in the margin of the data printout. It had all the hallmarks of a signal from a remote source in space, but never recurred despite many followup observations and may simply have been the reflection of a powerful signal from earth reflected by a piece of space debris. The META and BETA projects. A second impressive series of searches has been carried out by the Harvard SETI group. Their Project META which operated from 1985 until 1994 found 37 candidate events but none has been observed in follow up observations. They are currently using a 26m antenna feeding an 80 million channel receiver in Project BETA to carry out a full survey of the northern sky. The UC Berkeley programme called SERENDIP operates in a "piggyback" mode by operating alongside simultaneous radio astronomy observations. Their current instrument searches 168 million channels simultaneously and operates at the 305m Arecibo Observatory so using the most sensitive receiving system in the world. Versions of the receiver are being developed for use in Australia (see below) and Italy. 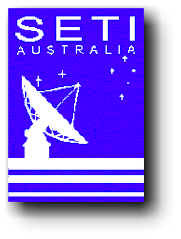 The SETI Australia Centre operates a research project called Southern SERENDIP piggybacked onto the CSIRO's 64 metre Parkes radio telescope, the largest in the Southern hemisphere. It can currently scan 8 million channels every 1.7 seconds and a new receiver system will soon increase this to 64 million channels. This is a particularly good time to use the Parkes telescope as it is carrying out two surveys of the southern sky at the frequencies of most interest to SETI astronomers. In the late 1970's NASA had established two SETI programmes which would use a dual mode strategy. The group at the Ames Research Centre would implement a Targeted Search looking for signals from the vicinity of the nearest 1000 Sun-like stars. In contrast, the JPL group would carry an all sky survey. In this way weak signals from what are perhaps the most likely places where life might exist could be detected but that strong signals from anywhere in space would not be overlooked. In 1988, after a decade of planning and design, NASA funded the programme and four years later observations begun. Within a year the American Congress, attempting to find token cuts in the Budget, terminated the funding. The SETI Institute, originally established to help run the NASA programme, took over the sophisticated receiving systems systems from NASA. The Institute, based in Mountain View, California, is now funded by private donations. Frank Drake, who made the very first SETI observation, is its President and Jill Tarter its Director. Since 1993 they have developed the receivers further to use in Project Phoenix - the most comprehensive series of SETI observations ever attempted - and support a wide variety of other SETI activities.